Residential Roof Replacement by Consolidated Roofing Systems provides homeowners quality with peace of mind. The North Carolina areas we service are the surrounding Triangle areas of Apex, Cary, Chapel Hill, Durham, Raleigh, Sanford and Fayetteville. Most importantly, we have one clear mission—to help find a solution and give you our best service every time. Our focus on quality means that you can trust our work to last. We even give you a 10-year workmanship warranty on top of our manufacturer product warranties. Therefore, we only use top quality roofing products with the best industry warranties you can find so that you know you will get the longest life from your roof and your insulation. Protecting your home matters to us and we will do the job right for you. 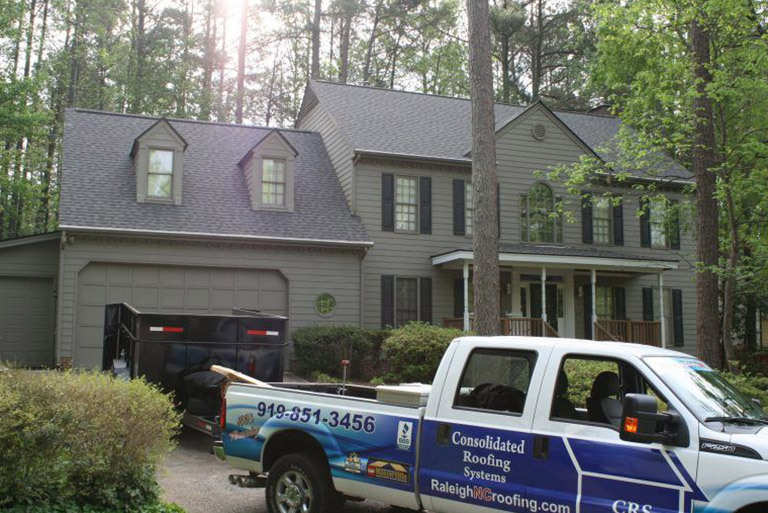 CRS is a fully insured and professionally certified among Triangle roof companies. We are trained and certified by GAF, CertainTeed and Owens Corning so that we are always on top of the latest roofing products, technology and techniques. Whether you are buying or selling a home and need a roof inspection, need new attic insulation or more, Consolidated Roofing Systems are the roofers Apex, Cary, Chapel Hill, Durham and surrounding Triangle customers have counted on for more than 30 years. As a result, we stand by our work and are committed to your satisfaction. Count on us for incredible focus on quality, service and efficiency every time.